Italy MillionDAY is one of the newest and most exciting lotteries in not just Italy but the entire world. Although the jackpot is fixed at a modest €1,000,000 (US $1,130,966), its incredible odds, cheap price tag, and frequent draws more than make up for it. As a result, MillionDAY is a game that we’re very excited about—and you should be too. We’ll explain why exactly below. As mentioned above, MillionDAY is extremely new on the international lottery scene. 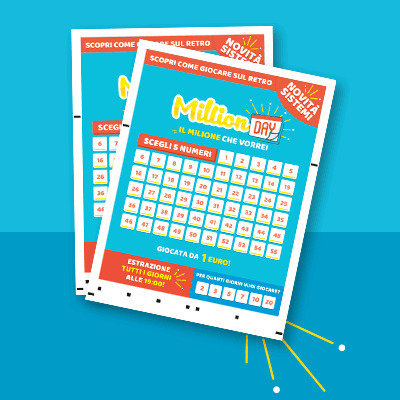 Launched just in February of 2018 by IGT’s Lottomatica, MillionDAY is based on the success of the American daily “cash games” that operate alongside bigger weekly lotteries such as the US Powerball and Mega Millions. Since its first draw was held on February 7, 2018, the game quickly became the market leader in the daily category, and it shows no signs of slowing any time soon. 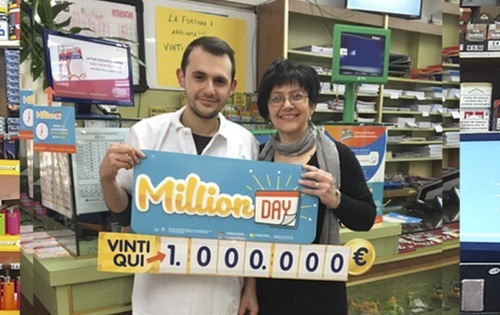 Just nine days after being launched, the first MillionDAY jackpot was won in Catania. On March 7, exactly one month after the first draw took place, it became possible to buy tickets to the game online. This made things much more convenient for Italian players, who no longer had to line up in queues at lottery ticket retailers. Finally, on May 25, the Italian Customs and Monopolies Agency incorporated a few changes to the game. One of these was that players were permitted to play a maximum of separate 10 entries for each draw, and a national cap was set on the amount of entries (200) that could have the same number combinations. Playing MillionDAY is a piece of cake: choose 5 numbers from a range of 1 to 55. If you match all 5, you win the jackpot! Tickets within Italy are just €1 (slightly more via online ticket agents), and you can win a prize even if you match only 2 numbers. There are no bonus balls or anything else that would complicate the gameplay, meaning you can focus on all your attention on winning. Considering its top-tier prize is a fixed and guaranteed €1 million, MillionDAY’s jackpot odds (1 in 3,478,761) are the best we’ve ever seen in any lottery of this size. In fact, almost every comparable international lottery game has smaller jackpots and odds that are twice or thrice as hard. For example, your likelihood of winning Ontario 49, which has a fixed jackpot of CAD $1 million / €1.37 million, is 1 in 13,983,816; Australia Monday Lotto jackpot caps out at AU $1 million / €631,000, and its odds are 1 in 8,145,060, and UK Thunderball has a fixed jackpot of £500,000 / €586,523, and its odds are 1 in 8,060,598. In other words, Italy MillionDAY an extremely intriguing and fair game of luck, and the fact that the overall chances of winning a prize are 1 in 17 is the icing on the cake. Italy MillionDAY features the word “DAY” so prominently in its title because every single day of the week has the potential to turn players into millionaires. The draws take place at the Lottomatica headquarters every night at 7:00 pm CET. Please note that though ticket sales within Italy end at 6:45 pm CET, ticket sales through online lottery sites usually end several hours before that. In addition, all prizes must be claimed and picked up within 60 days of the day of the draw. Since every MillionDAY jackpot is capped at a fixed €1 million amount, all of the jackpots in the game’s short history have been identical. The good news is that due to its truly exceptional odds, there have been many jackpot winners since the game first appeared on the lottery scene. As a result, the chances of you joining this list are relatively good compared to pretty much every other lottery in the world. Italy MillionDAY pays out all prizes as single lump-sum amounts directly into winners’ Italian bank accounts or post office accounts, or issues winners a cheque. Secondary prizes can be picked up at any regional lottery office, while the grand prize must be picked up from Lottomatica’s headquarters in Rome. If you want to play the MillionDAY lottery from abroad using an online lottery site (more on this below), whatever company you choose will take care of all that for you. If you, like most people, don’t enjoy paying taxes, we’ve got good news and bad news about MillionDAY. The good news is that the four amounts in the prize breakdown table above are exactly the amounts that you’ll take home. The bad news is that that those prizes could’ve been 8% bigger if the Italian tax man didn’t take his share first. In other words, all of the Italy MillionDAY prizes that are advertised are the post-tax amounts. For example, the full value of the €1 million jackpot prize was originally €1,086,956.52. While that may be somewhat annoying, it’s ultimately nice that this lottery pays out such well-rounded prizes. After all, when you tell people “I’ve won a million” after your big jackpot windfall, you’ll be 100% honest and accurate. If you don’t have plans to visit Sicily, Rome, or any of Italy’s other magnificent cities any time soon, then the second-best option for getting in on the MillionDAY action is to play the game online via one of these great online lottery sites. In addition to letting you play the biggest and best lotteries from all over the world, these kinds of sites often have great welcome offers for new customers, promos that will save you money, lottery subscription options so that you can pay in advance for weeks or even months of draws, syndicates (aka lottery pools) that greatly boost your odds of winning, and much more. Italy MillionDAY – Is It Worth Playing? Between the absolutely phenomenal odds, great prizes, four prize tiers, and cheap tickets, Italy MillionDAY has quickly become one of our favourite lotteries. As such, we have no qualms whatsoever about ranking it alongside the best lotteries in the world. In a nutshell, if you haven’t played MillionDAY yet, you’re truly missing out on an extremely fair and well-balanced lotto game that could very well change your life for the better. This is not just my favourite new lottery but probably favourite lottery OF ALL TIME. Before reading this article, I only know about Italy's other lotteries like Lottomatica and SuperEnalotto, which I didn't like because the odds were terrible. This one truly has unbelievable odds! Hoping I can win €1 million this year!